If you’ve heard of Zagg.com, you also probably know that they love having contests and giving away prizes. In fact ZAGG is currently giving away a game system every day this month. The company has become famous for their ipad giveaway every hour on Black Friday along with other iPad contests. To date the company have given away a total of 170 iPads. But the truth is most of us can’t find the ROI in doing it. So how is Zagg capable of constantly giving away these prizes? To answer I talked with Scott Cowley the head of SEO for Zagg. How were you able to pitch your boss into giving an iPad away every day? Our contests all start with internal ROI projections. Often it’s easiest to figure out what the break-even point is going to be and determine how many new fans/followers you’ll need to get to reach that (which is only possible when you know the annual value per fan). In 2010, we started with an iPad-a-Week giveaway, which gave us a proof of concept. We’ve done iPad-a-Day off and on for a while, and have had very successful iPad-an-Hour contests on Memorial Day and Black Friday. iPad-an-Hour worked because we ran it in conjunction with large sales. What are the key indicators that you track to be able to decide if a contest was successful or not? So at ZAGG, we look at a few things to determine how much value is being generated and I encourage other marketers to get this granular. 1st – How much money have we made from people who landed on our contest page and later purchased? 2nd – How much money have we made from traffic that wouldn’t have been generated without the contest? Using our referring traffic report, we can see which other sites wrote about the contest and sent visitors to our site. We recognize that a very small portion of “contest site” traffic will convert, but these are still conversions that wouldn’t have come without the contest. We also incorporate incentivized sharing into many of our contests. But instead of making people share the contest page with their friends, we may have them share another message about one of our products or pieces of content, along with a short URL that we’ve synched with our ecommerce system. This allows us to see how many clicks and how much revenue was generated from these peripheral visits from social networks. Again, these clicks/visits wouldn’t have happened without the incentivized sharing due to the contest. Which contests have had the best ROI so far and which contest has had the worst? 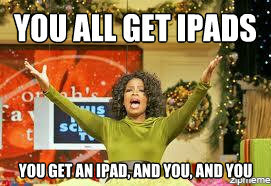 I think our iPad-a-Day contest had the best ROI and that was somewhere up in the 600-1000% ROI range. Our worst contest still had a 100%+ ROI. It was called ZAGGreach and we pulled the plug on it early. Give away something that everybody wants. Collect an e-mail address as a means of entry. Require the sharing of a specific non-contest message for additional entries. Optimize every part of the contest process for branding and product promotion. Getting attention is an easy thing if you’re giving away an iPad. Keeping that attention is where companies succeed or fail. Too many companies go into “contest mode” where, for the duration of the contest, all of their messaging is contest-related. This kills retention and branding. Instead, you should be using that opportunity to get your best stuff in front of these new people, whether by e-mail or social networks. Email is a more important sales channel for us than social media by a long shot. I’ve also written about several other ways that companies hurt themselves when doing online contests and promotions. In the case of ZAGGreach, we considered that a failure because we had to kill it early. It was reliant on a custom Facebook app we hired a company to build. It was ambitiously complex and we had major issues with uptime and accuracy. We started getting complaints and we realized that we risked doing permanent damage to ZAGG’s brand the longer we let it go on, hoping the company would fix it. As I mentioned, we still had a 100% ROI, but potential brand damage wasn’t worth trying to make it work. The big lesson there was that customers prefer a reliable, simple contest to a creative, but complicated one. Do you see significant increases in ROI the bigger/more expensive a contest is? If so, is there also a point of diminishing returns? I’ve often considered this question–is contest success more dependent on the prize or the promotion? I gave away a package of bacon on my blog once to find out and ended up with over 300 entries. But that’s nothing compared to the 2,000,000+ entries that ZAGG received by giving away an iPad 3 every hour on Memorial Day this year. I think prizes will always be judged on perceived value more than actual cost. If we had given away $1000 cuff links instead of iPads, I guarantee the response would have been lukewarm. But people can get tired of iPads. We saw a resurgence of success and ROI when we switched from iPads to Kindle Fires. The Kindle Fire was a third the price of an iPad, but we saw equally strong ROI because we tapped into a new group of people. We’ve noticed that there’s definitely a point of diminishing returns. Drew Conrad, our Social Media Head, points out the sharp declines of our multi-week contests in slide 8 of this presentation. We try to avoid long, drawn out contests because of this. We also take breaks from our contests for weeks to months, just to avoid customer fatigue. These contests are great for gaining social followers, how does that contribute to your marketing plan? Gaining social followers is great for any marketing plan when you know the value of a follower and when you’re adding potential customers as followers. We’re a national company so we don’t care where our contest participants live. A local company, on the other hand, needs to modify its contest approach or be stuck with a bunch of irrelevant fans. Aside from building social following, do these contests help attain links to help increase your products rankings? They can. There are a lot of contest sites and blogs out there and they all link to the contest page. You may get additional links to product pages if that’s what you give away. For ZAGG, giving away iPads and Kindle Fires results in some decent, relevant links because many of our keywords are iPad-related, so even though a link may come from a contest site, that link will be on a page filled with relevant text and have partially relevant anchor text. My favorite thing to do is use our analytics from past contests to plan for even better success. We contact everyone who sent us referral traffic last time and try to add a few more each time. We develop relationships with the site owners and learn how they like to be contacted, how much notice they want, etc. If you’re at an agency and you have a client who has never run a contest before, use other clients’ analytics to see where they’ve been able to get contest traffic from and replicate that. A nice, well-rounded contest should be getting traffic from many different sources. What tools do you use to help you run your various contests? We’ve got some excellent in-house developers who are great in working with various APIs and integrating our contests with our databases. Most of our experiences with 3rd party tools have actually been a little disappointing. Plus, we like to keep as much contest interaction on our website as possible. Tips for people in running a contest for the first time? 1. Know which metrics you want to see increase and calculate how much a unit increase of each metric is worth to you. 2. Give away something your potential customers would want to win and is compatible with your product/service/brand. 3. Incentivize people to share the contest. 4. Keep everything as simple as possible. Simple means happy participants, higher participation, ease of management, and better tracking/evaluation.